Up until 1935 the MG Car Company and Morris Motors were essentially separate companies although both were owned by Sir William Morris. Following a takeover in 1935 the two concerns were incorporated under the umbrella of the Nuffield organisation which also owned other marques such as Wolseley and Riley. From then on the derivation of MG models was to be from several camps in order to rationalise and to introduce a common parts policy. Two years later the MG model range included two saloons, the SA and VA and a year later the larger WA saloon appeared which sported a 2,561 cc engine. These saloons were introduced to compete with the large saloons available from S.S. Cars (who later became known as Jaguar Cars Ltd). 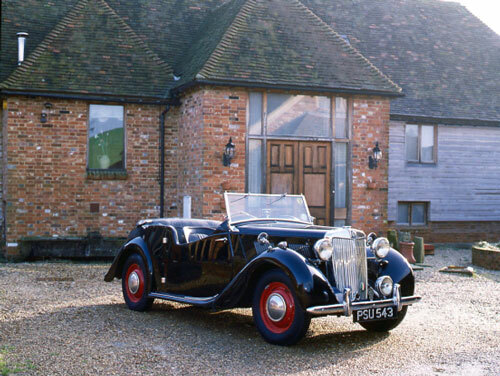 In the Morris camp, there was a Ten Series M saloon available during 1938 to be followed by the launch of the Eight Series E at the October Motor Show. MG needed a compact size saloon to compete with the cars offered by Singer, Riley, Triumph and Sunbeam-Talbot and to compliment their S, V, and W range. The MG Y Type Saloon or one and a quarter litre MG Saloon as it was better known was on the drawing board between 1937 and 1939 ready for introduction in 1941. Codenamed EX 166, it was really an MG version of the Morris Eight Series E and was designed by Syd Enever and Alec Issigonis in the Morris design studio at Cowley. The war put paid to plans for a 1941 launch and the car did not see serious production until 1947. The all steel body closely resembled the Morris, but had suitable modifications to the front and rear to give the traditional appearance of its MG forerunners. With its specially swept tail and rear wings together with the distinctive vertical chrome slatted front radiator grille, this was definitely from the MG camp. Alec Issigonis was a suspension design specialist and he was able to introduce for the first time on a British production car, an independent front suspension system which consisted of a coil spring and wishbone. Another first was the employment of rack and pinion steering instead of the Bishop Cam type and the Y type was the first Nuffield car to be so equipped. The separate chassis was completely new and differed from the Morris equivalent with the frame being of welded box section with four cross members and it was under-slung at the rear with leaf spring suspension. Damping was effected by means of Luvax Girling double lever arm, piston type dampers at the front with single arm dampers at the rear. A very worthwhile addition to the chassis design was the fitting of a Jackall hydraulic jacking system. This system had been incorporated on the larger pre-war MG saloons and was fitted as standard on the Y type. Solid and robust the Y Type chassis was to form the basis for many future MG sports models, however like so many pre-war designs the car was too heavy for its engine. Powered by the XPAG engine of 1250 cc as used in the TB Midget, the unit only had a single carburettor and thus the power output was a meagre 46 bhp @ 4,800 rpm. With the car weighing in at nearly 21 cwts, it was some 440 lbs heavier than the TC; therefore performance was far from brisk. It was however an ideal cruising car with a high degree of comfort and luxury. Power was transferred to the rear wheels via a four speed gearbox with synchromesh on second third and top. Transmission to the banjo-type back axle was through a Hardy Spicer tubular propshaft with needle roller universal joints. Braking was by means of a Lockheed hydraulic system acting on 9" diameter drums front and rear. The whole car was extremely well appointed by post war depression standards and was very much in the style of the pre-war S, V and W saloons and tourers. With a luxury leather interior and walnut dash board, it received a warm welcome from the motoring press and public alike when it was announced in the spring of 1947 at a price of £671 including purchase tax. The car enjoyed very good sales both on the home market and abroad and although of compact dimensions and not particularly roomy the Y type gave a smooth ride with excellent roadholding and at the time was considered exceptionally comfortable compared to its rivals. Such features as an opening front windscreen, telescopically adjustable steering column and rear window blind all enhanced the specification of what was already a luxury vehicle. Wheels and tyres: Bolt on ventilated disc 5.25 x 16"